What are the benefits and risks of fat grafting? It may last longer than an implant. Fat is removed from an area where you don’t want it. May reverse some of the side effects of radiotherapy, including; a reducing thickening of the tissue in the radiated area, reducing skin tightness, and possibly lessen the appearance of blood vessels under the skin. Theories about why this occurs include; that stem cells in the transplanted fat tissue may stimulate healthy breast tissue to develop in the area, or that fat can create new blood vessels that increase the blood supply in the new breast. No large clinical studies with long-term follow-up have been done on fat grafting; while small studies report good results, this technique may not work for all women and there is uncertainty about how long the results will last. A less predictable result than with a silicone implant. Depending on which surgeon you choose to do the procedure, you may be required to wear the Brava (Breast Enhancement and Shaping System) device or another type of external tissue expander for 4 or more weeks before the fat injections and for several weeks after. Depending on the size you would like your reconstructed breast to be, you may have to have multiple (4-6) fat grafting procedures that are done over a period of months. The injected fat may be reabsorbed by the body and you may lose some or all of the breast volume over time, possibly necessitating further surgeries. However, fat transplantation and handling techniques have significantly improved over the past decade so that current studies show about 75% (or more) of grafted fat survives. Because some fat cells can stimulate cell growth, some doctors have been concerned that fat injected into the breast area may cause dormant breast cancer cells to grow; although the research studies done to date have shown there is no increase in the risk of breast cancer. Some of the fat injected into the breast area may die, which is called “necrosis.” Symptoms of necrosis may include pain and bleeding, the skin turning dark blue or black, numbness, fever, and sores that ooze a bad-smelling discharge or pus. You may exhaust a key tissue source for a future flap reconstruction if fat grafting doesn’t work. Can be expensive (as it not yet covered by most health insurers in Australia) and can only provide enough volume for a small – medium size breast. In preparation for surgery, you may be required to wear a special bra (such as the BRAVA device) for a month or two, for several hours each day. The bra has a suction device, which helps to expand the breasts and create a space in preparation for the transferred fat. The use of this device is particularly recommended for those women with tight breast tissue, or for those who have had radiotherapy as it enhances the survival rates for the transplanted fat. Studies have shown that wearing the BRAVA device seems to be important for the reconstructed breast to maintain its volume. The BRAVA can increase breasts by one to two cup sizes. This is not maintained once the machine is no longer worn. The surgery is usually done under local anaesthetic. Fat is removed from one section of the body and inserted into the breast. It is centrifuged after removal, which means unnecessary fluid is removed, concentrating the fat to the most effective portion to inject. It is then injected through very fine cannulas into the breast and spread and layered in a very precise manner in micro-droplets to ensure all the fat cells have a good blood supply to survive. Fat transplantation techniques have significantly improved over the past decade due to more careful harvesting, handling and injection techniques for the fat, greatly improving the survival rate for the fat. After the surgery, the suction bra is worn again for a week or so to help maintain the volume achieved. The surgeon will order a pre-operative screening MRI and follow ups MRIs to ensure no changes have developed in the breast. A skilled radiographer will be able to identify any concerning lumps in the breast compared to grafted fat. A: After mastectomy, the skin is flat against the chest muscles. Skin wrinkling and scarring are present. B: The external BRAVA expander stretches the skin and thickens the underlying tissue, creating a tissue scaffold in which to inject fat. C: Fat is injected into the muscle and fatty layers in small thread-like layers. A: After the first fat grafting procedure there is a very small breast mound and the skin is less wrinkled and tethered with scar tissue. B: Three weeks of BRAVA expansion produces a substantial breast mound. 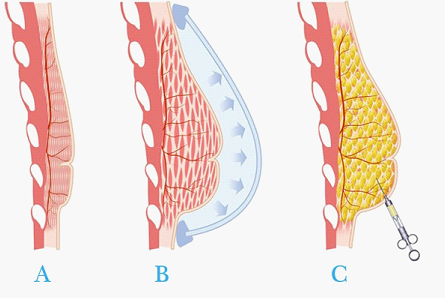 C: Fat is injected into the breast in hundreds of tiny threads producing a significant breast mound. Later stage procedures build on the previous one, with the ability to add greater volumes of fat with each stage. It’s important to give the reconstructed breast time to heal, about 4-6 months, before judging the results. Still, some women may have a small difference in the shape, balance, or position of the reconstructed breast compared to the other breast. Because there are so many variables, there is no real standard approach to fixing minor flaws after reconstruction. One technique becoming more common is lipofilling. In lipofilling, fat tissue is removed from another part of your body, your abdomen, for example, processed into liquid in a lab, and then injected into the reconstructed breast to improve its shape or fullness. It’s often used for things like softening and improving the skin over an implant; filling in imperfections; or giving more lift to a flap reconstruction. More and more surgeons are using lipofilling and some health insurance companies are covering it, although getting it covered can still be an issue. Some plans still classify lipofilling as “experimental,” although multiple studies have shown its usefulness. While some doctors have wondered whether lipofilling would increase the risk of the breast cancer coming back (recurrence), studies done in 2011 and 2016 strongly suggest that women who have lipofilling are no more likely to have a recurrence than women who never had lipofilling. Very thin women, without adequate fat stores that can be used to recreate or enhance their breasts are not good candidates for this surgery. The best candidate for fat grafting surgery is someone who does not like the idea of having breast implants and who would like a small to medium sized natural looking soft breast with little scarring. As this procedure is generally done under local anaesthetic, the recovery time is fast. Patients are usually up and walking around on the day of surgery. Smaller fat grafting, or lipofills, can be performed as day surgery. Your surgeon will provide post-operative medication and advice to ensure good pain control. You will be required to wear a firm garment (such as an abdominal binder or other compression piece) for some weeks following liposuction to minimise bruising and swelling in the area where the fat was transferred. These garments are skin tight and can be worn under clothes without being very visible. There will only be very light dressings on the breast/s where the cannula entry points for injection have been placed. If using the BRAVA device, or similar expansion bra, you may need to wear this for a further week or so after surgery to maintain volume. Bruising varies from patient to patient but should resolve in most within 2 – 3 weeks.